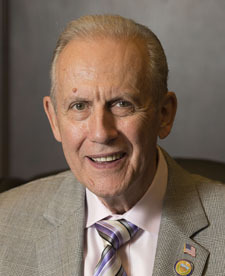 John Palmiere was appointed to represent District 6 of Allegheny County Council on January 21, 2011, to finish the unexpired term of Ms. Joan Cleary. John served for over 23 years as the Director of the Baldwin Whitehall School District, a position requiring him to remain aware of education issues and of the ever-changing world of local and state concerns. As the District Director, John guided 84 percent of graduates of Baldwin Whitehall High School to pursue post-secondary education. He oversaw the Board through difficult transitions and large projects, including the $64 million renovation of the high school. John served as the Director of the Allegheny County Intermediate Unit, which enhanced his understanding of our region's education system and allowed him to confront problems impacting the 42 school districts in Allegheny County. He is a member of Baldwin Whitehall High School's Dedication Committee and is a board member of the Friends of the Baldwin Whitehall Theater Arts. As an entrepreneur, who began Palmiere's Hair Center 40 years ago, John's seasoned local business experience allows him to relate to business owners and the economy of Allegheny County. Through his professional career, he interacts with constituents every day, giving him a constant perspective of citizens' opinions. He was an Adjunct Instructor at the Pittsburgh Barber School and the Professional Barber and Beauty Supplies, Inc., and he currently holds a Pennsylvania Barbers License and Pennsylvania Shop Managers License. He has been a member of the UFCW, Local 23, Barber Division for over 40 years.